Usually it’s his iconic 1952 Topps card that comes to mind. But the 1951 Bowman is actually his official rookie card, albeit less popular and less valuable than its 1952 Topps counterpart. Make no mistake, collectors go crazy for both cards. No doubt about it. So much so that both are ranked high on the list of the most valuable baseball cards in the hobby. For that reason I’m going to talk about both of them. But it’s important to understand the key differences between the two. 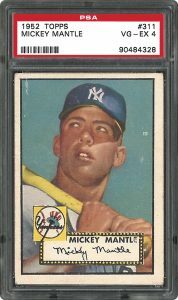 This guide takes an in-depth look at each card to give you the details about what to know when hunting for a Mickey Mantle rookie. In my opinion, the tiniest details about baseball cards make this hobby great. The slightest nuances can mean the biggest difference when determining the value, importance and rarity of your cards. A card’s number within a print run sequence. An important year for a player or team. You name it, they all matter. And these two legendary cards we’re about to discuss possess many unique details of their own. Distinction: This is his true rookie card. If you look closely, you can even make out a sliver of the number 6 on the back of his jersey. He began his career with the Yankees as number 6 and wore that from his first game until July 15, 1951, when Casey Stengel sent him back to the Triple-A league Kansas City Blues during a bad slump. He was called back to the Yankees on August 24 that same year, was assigned #7 and wore it until he retired. Number: This is card #253 which makes it one of the high number series cards (#253 – 324) in the set. High number cards are more scarce so that further boosts the premium that Mantle’s card carries. Measurement: The card measures 2-1/16″ by 3-1/8″ with a horizontal layout. Out of 324 cards in the set, only 39 were printed this way. Both the Mantle and Mays rookie cards received this key distinction. Design: The reverse side of the card was printed vertically. And it’s fun to read through and see what the Bowman Gum company was saying about the young Mantle back then. Notice the sentence fragments like “Kept on clicking when the season got under way.” The grammar isn’t perfect but who cares? I think it gives the card even more character. 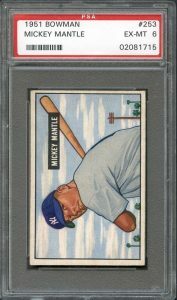 Condition Issues: High number cards in this set like Mantle’s are notorious for showing print lines, poor centering and even wax stains on the reverse side. Look at the picture above and you can see a stain covering his personal information. Usually in this hobby, a player’s true rookie card will be his most valuable. That’s not the case with Mantle. There are a number of details that make this card more valuable and more sought after than his actual rookie. Let’s face it, this card is practically the face of the hobby. Other than the T206 Honus Wagner, there really isn’t another card that could make this claim. It’s definitely the most important pre-War card. That much you can’t argue. Distinction: This is not his true rookie card but it is the first time he appeared on a Topps card. That, among other things, is what makes this card so valuable. The 1952 Topps set is the most important and sought after post-War set and Mantle is the key card. 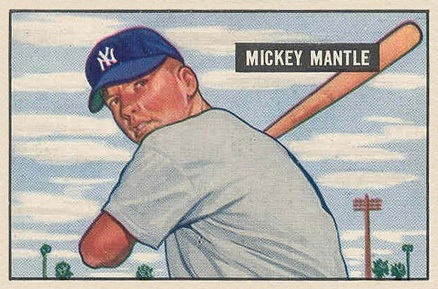 Number: Topps released its 1952 set in two different series. 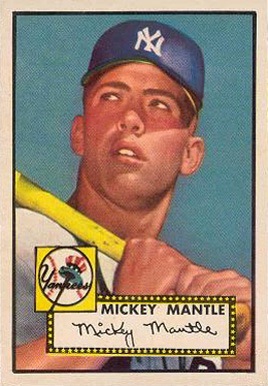 Mantle’s card is #311 which makes it one of the short-printed high number Series 2 cards (#311 – 407) in the set. Topps printed fewer high numbers as a way to reduce their risk of diminished or cancelled orders from retailers so late in the season. Fewer print runs means these high number cards are more scarce and automatically carry more value. Measurement: The card measures 2-5/8″ by 3-3/4″ with a vertical layout. Design: The reverse side of the card was printed horizontally. 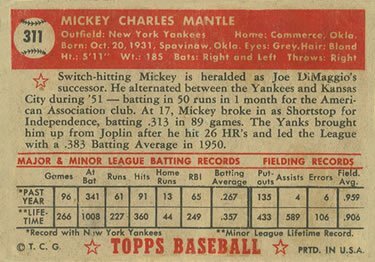 Mantle’s personal information and stats dominate the card back but there’s also a nice write-up of his success in the Minors and status as DiMaggio’s successor. It is the key card to the most important post-War set. Mantle’s cards are always valuable. He was a legend for the game’s most popular team. That automatically drives up value. His was one of the high numbers and we already mentioned those are more scarce and pricey. Topps dumped many of the 1952 set into the ocean after less-than-expected demand. So even fewer survived than what normally would have. I mentioned earlier how I love the subtle nuances about cards that make them special. Here is a prime example. As if the 1952 Topps Mickey Mantle card wasn’t already great enough, there are actually two different types to keep things interesting. While neither is more valuable than the other (given they’re in the exact same condition), it’s still fun to hunt down their differences. There is a pixel missing in the lower left border of the Type 1 giving it a rounded look. The name badge on the Type 1 bleeds yellow along its bottom. The ‘e’ in Mantle’s facsimile on the Type 1 curves upwards where on the Type 2 it ends sharply. The overall color scheme of the Type 1 is darker and more rich. The background coloration is obviously different but even his cap, skin tones, and bat are as well. There is a blue pixel missing in the upper left background on the Type 2. The border around the Yankees logo on the Type 2 is not as prominent and bold. The border around the nameplate on the Type 2 is not as sharp. Look at how jagged it appears all the way around. The upper black horizontal border of the Type 2 slightly overlaps the vertical borders. So those were some of the main differences on the front sides. But there are still more on the reverse sides. There is really no good answer for this. 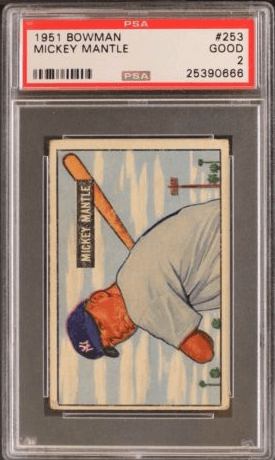 Somewhat sarcastically, the price of a Mantle rookie can range from “not cheap” to “astronomical”. The number one determining factor is condition. Other things like number of bidders in an auction, overall eye appeal, and current market health will factor in as well. But condition is always key. Centering – From top to bottom and left to right, how well is the card centered? 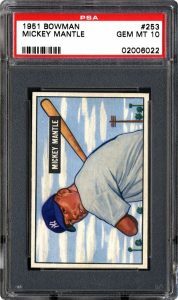 Centering is probably the biggest concern for most collectors. On the front side, if a card exhibits no worse than 55/45 to 60/40 on the front and 75/25 on the back then it is usually considered a centered card. Corners – You want to see sharp corners. Ideally “razor sharp” as many auctioneers and sellers like to say. Round corners are signs of heavy use and are eye sores. Edges – Nice clean edges go a long way to help a card’s eye appeal. Sometimes you’ll see vintage cards that were poorly cut and don’t have nice clean edges. Professional graders (and collectors) will make exceptions for cards with known cut issues. But when possible, you want to see edges free of chipping and notches. Surface – One of the easiest ways to ruin a card’s value is if it has a crease in it. Other issues like indentation, marking, scratching, and staining can significantly reduce a card’s value. In the case of a virtually perfect, gem mint 1951 Bowman #253 you would see it sell for more than a $1 million. Maybe more. They don’t come up for sale very often in that grade anyways. In poor condition you can find them for less than $2,000. Still not cheap, but that’s the minimum you’re going to have to pay if you want to own this kind of baseball card history. 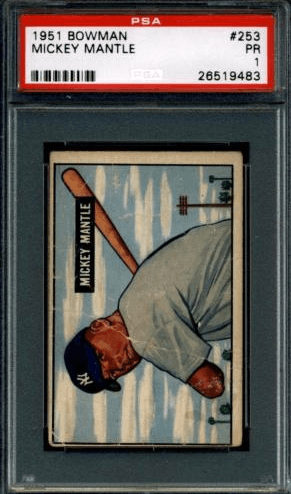 Here is a look at what the 1951 Bowman card looks like graded from PSA 10 Gem Mint condition through PSA 1 poor condition. As you’ll see later on with the same rundown for the 1952 Topps Mantle, I think it’s a bit harder to tell the difference between some of the grades. That’s just because of its design I think. 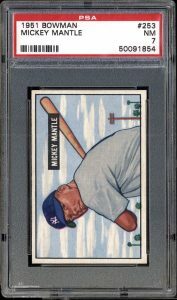 In the case of a virtually perfect, gem mint 1952 Topps Mickey Mantle card you’re talking millions of dollars. It’s hard to even say in today’s market. On the very low end in poor condition, you’re still talking anywhere from $5,000 to $10,000. Some have sold for even more in that condition. Eye appeal, market condition, and number of bidders in the fight can heavily swing things. 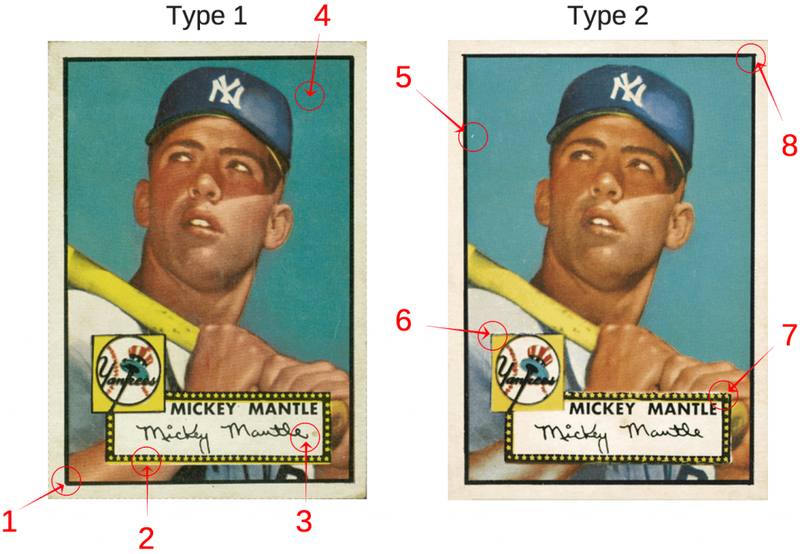 To give you an idea of what a 1952 Topps Mickey Mantle looks like from gem mint to poor condition, take a look at this sequence below. Notice how centering, corners, edges, surface–all those things we talked about above–get worse and worse as you progress down the line. On the higher end of things it can be difficult to tell with the naked eye. That’s why professional graders use quality magnification equipment to help them make the final call. Mickey Mantle was not the greatest to ever play the game but he is high on the list. Pitchers feared him. Fans adored him. He possessed an otherworldly amount of raw speed and hitting talent. His tape measure home runs from both sides of the plate are the stuff of legend. 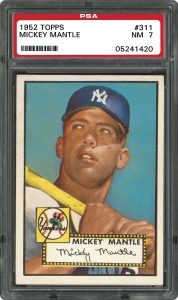 Mantle was the face of the game throughout the 1950’s and 1960’s and to many collectors is the face of the baseball card hobby as a result. That’s why his cards are so valuable and sought after. He is so popular among collectors that his card is usually the most valuable in any set in which he appeared save maybe the 1963 Topps (Pete Rose rookie), 1967 Topps (Tom Seaver rookie) and 1968 Topps (Nolan Ryan rookie) sets. One thing is for certain: if you own a Mantle card you’ve got something special. If you own either his 1951 Bowman or 1952 Topps cards then you’ve got something legendary.